Saturday for lunch we planned on a weiner roast, but it was really windy. In spite of the wind the boys managed to get a fire going. Jakob was so happy, he was looking forward to it all week! Jakob was so happy that he was finally old enough this year to hold his own stick. He loved every minute of it! After lunch the boys did some clean up with the quad and on the way home went through a mud puddle or two. Jakob thought it might be fun to wash the quad off. When Levi woke up from his nap, he couldn't get enough of the quad. He was happy to sit on it and pretend to drive. 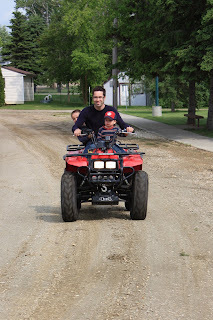 Michael took the boys for a short ride on the quad, they are still talking about it! !